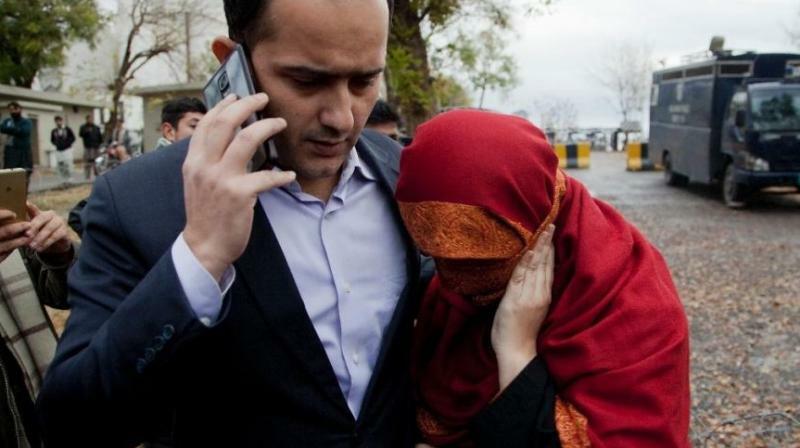 “The Islamabad High Court reserved on Tuesday judgment in the juvenile housemaid’s case who was allegedly tortured at the residence of a judge by his wife. Justice Aamer Farooq reserved judgement after the Islamabad Advocate General Tariq Mehmood Jahangiri, who has recently replaced Mian Abdul Rauf, and defence counsel Raja Rizwan Abbasi and Raja Farooq concluded their arguments in the case. The Additional District & Sessions Judge (ADSJ) Raja Khurram Ali Khan and his wife Maheen Zafar, were booked and had later been charged for allegedly assaulting, confining, ill-treating, neglecting, abandoning, harming and injuring the minor housemaid. They have been accused of keeping the girl in wrongful confinement, burning her hand, beating her with a ladle, detaining her in a storeroom, and threatening her with even worse. The couple had pleaded ‘not guilty’ after they were indicted and stood trial. On December 29, 2016, 10-year-old maid’s case was registered and she was still awaiting justice as her trial was being conducted at the IHC. The police probe into the incident involving brutal torture on the child maid points out violence and abuse meted out to the victim by the wife of the sessions judge, who himself has been accused of employing the minor as maid in the first place. The gruesome story of the juvenile maid had revealed the cruel relationship between ‘masters and servants’ and government’s cosmetic measures to protect children. It had unearthed the way two judges of district court and a lawyer worked at breakneck pace to clear the judge and his wife of allegations of mistreating the child maid. The fact that the maximum penalty for pledging the labour of a child is only Rs250 [£1.50GBP / $2.1USD] in Pakistan had also emerged through the case. On January 3, two ADSJs, Atta Rabbani and Raja Asif Mehmood, and the lawyer Raja Zahoorul Hassan had tried to steer the couple out of trouble. Lawyer Hassan had mocked the reporters standing outside the courtroom, telling them to “recite Fateha over the case”. Later on, the Supreme Court took suo moto notice, voiced serious concerns at the loopholes in the ‘compromise’ reached under questionable circumstances, hasty handover of the child maid and the suspicious role of the counsel for her guardians. SC while declaring it a “sordid incident” had overruled the pardon granted to the couple by girl’s parents in the name of God. Human rights lawyer Sharafat Chaudhry talking to The Express Tribune had earlier said that ICT Child Protection Bill, 2017, has yet to be imposed as opposed to other provinces where similar legislations have already been imposed. He had added that the bill has yet to be tabled before the national assembly and senate contrary to some passed “overnight”. Apart from the SC’s notice and her trial at the IHC to ensure transparency, one good thing happened to her – she started studying. In one of her court appearances, she told Justice Kayani that she sat English and Maths exams the other day. Next, she sat her toughest examination – cross-examination in court by the defence counsel. The bad news for the child was that her mother passed away. In his statement before the IHC, minor’s father Azam had revealed that his wife passed away on Muharram 13, adding he was unaware about the calendar date. At one point, Justice Mohsin Akhtar Kayani during the hearing of the case had remarked that he had concluded a separate inquiry and found the judge to be guilty while suggesting “major punishment”. To this, judge’s counsel had raised objection and the case was later placed before Justice Aamer Farooq, who reserved judgment on Tuesday. It had unearthed the way two judges of district court and a lawyer worked at breakneck pace to clear the judge and his wife of allegations of mistreating the child maid. The fact that the maximum penalty for pledging the labour of a child is only Rs250 in Pakistan had also emerged through the case.